Aviaq Johnston’s Those Who Run the Sky is an exciting, coming-of-age story that should be read by every fifth-grader on the North American continent. Pitu is a young Inuit boy. He is out hunting when a storm hits and he becomes lost, without his dogs or weapons, and the strange storm takes him to a spirit world where he faces some of the toughest tests imaginable – from terrifying, red-eyed wolves to a giant who wants to add Pitu to her zoo (“Ah! You are so cute!” she laughs at him “Even your voice squeaks like a little lemming!”). When he gets away, it is in to the hands of Taktuq, a grumpy, bitter old Shaman who has also lost his way and hasn’t been able to leave this spirit world. Pitu comes to recognize that he is meant to be a shaman himself, but it will only be a worthwhile realization if he can find his way back to his land and his people. This coming of age story is tremendously powerful. 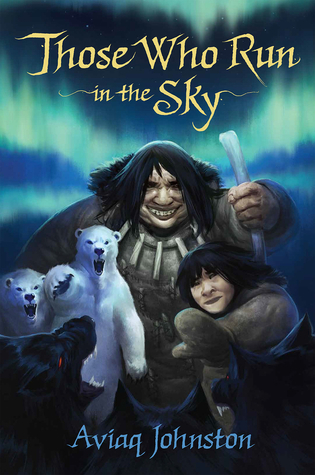 I don’t know the Inuit mythologies or customs at all (though after reading this I feel as though I am maybe beginning to understand some of it), but the reader gets the sense that Pitu’s journey has deep meaning to him and his culture and that there is some strong metaphors at work here. I wish I understood more of them! The young Inuit reader will likely pick up on this intuitively. The rest of us will get a sense of the power at work here, and we’ll still understand the basic tenets of over-coming fears and the fight to survive and finding/forging your own path. There is a lot of action here and at times we even get the ‘out-of-the-frying-pan-into-the-fire’ rapid challenge after challenge which certainly keeps the reader turning pages, but I found the encounter and lessons from Taktuq quite interesting. While he’s certainly painted as a bit of a curmudgeon, at his core he’s still decent (he took Pitu in and helped him recover). But his bitter attitude is poisonous to Pitu who recognizes that this could be him if he doesn’t find his way. The adventure aspect will keep youngsters reading, but the message will sneak in and provide a thoughtful experience. This is ‘Gary Paulsen’ for a new generation of young readers. Looking for a good book? Those Who Run in the Sky by Aviaq Johnston is a powerful coming of age story that reaches beyond the Inuit community and offers a strong message to all youngsters looking to find their place in the world.